What’s the Best Kind of Book Publicity? How Do You Spell Book Publicity Success? One of my new favorite bloggers, Guy Bergstrom, has some witty insights about generating publicity for film, music or books — and one of his blogs speaks directly about some of the things I’ve talked about here before — the supposed “secrets” of getting your self-published book noticed. Actually, many of Guy’s blogs do that, so do yourself a favor and head over there, using the link I provided above, and just browse a while. You won’t be disappointed. Of course, I naturally recommend you visit after you’re done reading and commenting here. (Guy follows this blog, and I hope he’ll forgive me for asking you to wait but, hey, I’ve got things to say, too). If you’re an indie author, I’m sure you’ve discovered marketing is the hardest part of your literary creation’s World Conquest. Once you’ve covered all your siblings, cousins, friends and neighbors with “The Word” about your new book, how do you reach the other 7,164,485,136 people on this shiny blue pebble? In truth, you don’t have to. You’d probably be deliriously happy with only two percent of those. I know I would. That’s still almost 150 million people … and if just one percent of those actually bought a book it wouldn’t cause J.K. Rowling to lose any sleep, but you’d be very comfortable. Which brings me back to The Big Question. How do you reach that interested one percent of two percent audience, meaning an audience willing to part with a couple of nickels to buy your book? “The Twitter” as Guy calls it, doesn’t sell any books. It isn’t meant to. It’s a site for meeting people and you’re bound to find a lot of other friendly creative writer types who’ll be nice to you … as they Tweet to sell you their own book. But the best way to use Twitter — or any other “social media” for that matter — is, as I’ve said before, to create and share meaningful dialogue with those friendlies, not to harangue people with a “BUY!” message. That only gets you “unfollowed” in a hurry. The best route to publicity, short of marrying whatever star / starlet is prominently undressed in the latest apocalypse movie, rescuing the Pope from terrorists, curing cancer, or crossing the Grand Canyon on a tightrope — which wouldn’t work anymore anyway since Nik Wallenda already did it — is with earned media. Earned media is media you don’t buy, but earn the hard way. PR is an example of earned media. Word of mouth is another. The good thing about it, other than it works … it’s free. 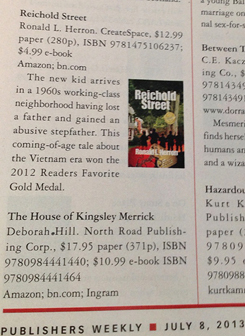 I followed some of Guy’s advice and got a mention for my award-winning novel REICHOLD STREET in Publishers Weekly. I’ve also been interviewed for an article in the local paper. I was prepared, because I’d already completed something else I mentioned that you, as an indie writer, need to have … a dedicated media page. I know, I know, it’s not the NY Times Review of Books … but it’s a start. And — except for a little bit of my time — it’s free. 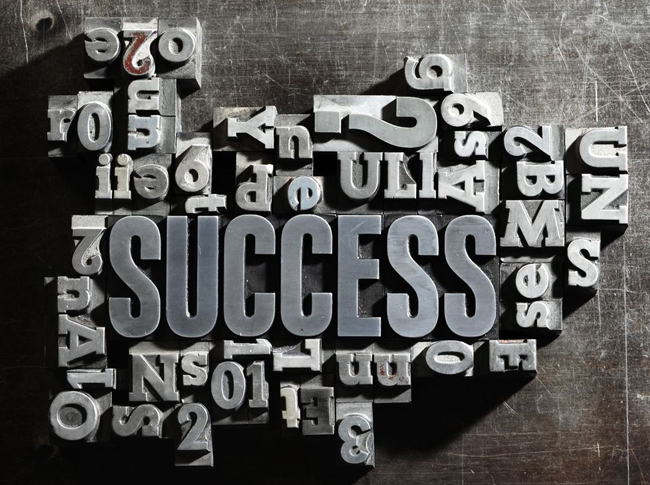 Speaking of free — you might want to visit the link on the right-hand column of this page, and subscribe for your FREE copy of my booklet “Creating Believable Characters.” I created it specifically to aid other indie writers … and at least the price is right. Now — after you leave a comment — it’s OK to visit Guy’s page. Just let him know I sent you. This entry was posted on July 12, 2013 at 5:44 pm and is filed under Award-Winning Fiction, Book Promotion, Free Stuff, Market Your Book, Storytelling. You can follow any responses to this entry through the RSS 2.0 feed. You can leave a response, or trackback from your own site. I remember Bill very well. He spent some time with us years ago. I read the first couple of stories on your blog, and enjoyed them very much. It pays to hone your craft, and the best way to do that is to read … and then read some more. Pay attention to the way sentences are constructed, the use of punctuation, and how the author “shows” you the scene instead of “telling” you. And keep on writing. You have promise. I know how you feel “compelled” to write. I’ve felt that all of my life. Most of my older blogs talk about the craft of writing, as well as how to promote it. I like to think there’s some useful stuff in them. Try the two located here. Read what you’re interested in but, by all means, keep on writing … and good luck with it. Scott posted a link to facebook and here I am. My brother Bill and Scott are old friends from high school.